Cable rows and vertical rows focus somewhat on the middle of the back. Lat pulldowns focus somewhat on the outer portion of the lats. This LeverEDGE High Row mimics the old school 45 degree row to hit somewhere in between. 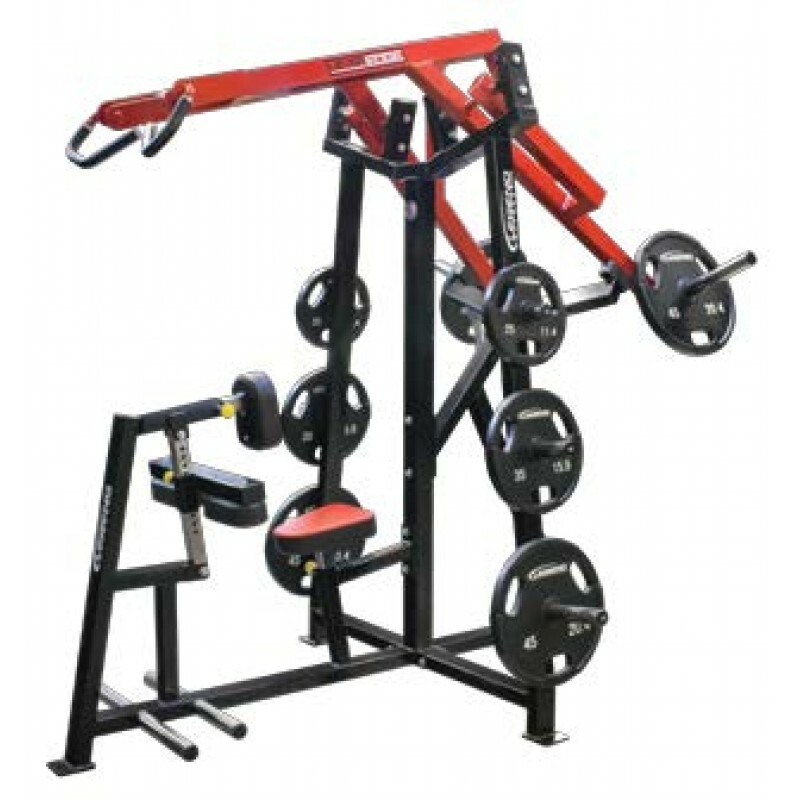 Together with the 6004 Seated Row and the 6005 Lat Pulldown, the 6009 High Row provides the wildly popular LeverEDGE line with a very complete suite of back strength solutions for bodybuilders and athletes. Like the rest of the LeverEDGE line, the cockpit of the 6009 is more adjustable than the competition, featuring four different positions in 2-inch increments for the seat and sternum pad, and 11 positions in 1-inch increments for the thigh pads, complemented by two position chrome-plated foot pegs. The LeverEDGE High Row is ready to help users in a variety of statures and limb lengths get a back workout they might not have had before. There are six chrome-plated Olympic bar-sized weight storage pegs that keep plates handy for rapid adjustments between sets. End caps are numbered for plate size. For the bigger brutes, athletes and bodybuilders out there, you can load up 9 plates on each lever arm. Multi-grip closed cell foam handles, carefully balanced diverging lever motion, a multitude of pad adjustments and two-position chrome-plated footpegs all combine to make certain that your next back workout “feels right”. The frame was designed using 3D CAD software to minimize the use of fasteners, so that assembly only requires six bolts. This translates to easier setup, less maintenance and extra rigidity!